… developments in postcognitivist theory and practice concerning technology from the fields of sociology, communication, education, and organizational studies, as well as from science and technology studies, human-computer interaction and computer-supported collaborative work. Although I’d balk at the idea of a post-cognitiv-ism for a couple of reasons, I find these books exciting, not only for the studies that each one presents, but for the broader intellectual movement that they together represent. An emphasis on understanding leads to one of the primary characteristics of the new science of learning: its focus on the processes of knowing (e.g., Piaget, 1978; Vygotsky, 1978). . . . Even young infants are active learners who bring a point of view to the learning setting. … In the most general sense, the contemporary view of learning is that people construct new knowledge and understandings based on what they already know and believe (e.g., Cobb, 1994; Piaget, 1952, 1973a,b, 1977, 1978; Vygotsky, 1962, 1978). A classic children’s book illustrates this point; see Box 1.2. Fish Is Fish (Lionni, 1970) describes a fish who is keenly interested in learning about what happens on land, but the fish cannot explore land because it can only breathe in water. It befriends a tadpole who grows into a frog and eventually goes out onto the land. The frog returns to the pond a few weeks later and reports on what he has seen. The frog describes all kinds of things like birds, cows, and people. The book shows pictures of the fish’s representations of each of these descriptions: each is a fish-like form that is slightly adapted to accommodate the frog’s descriptions- people are imagined to be fish who walk on their tailfins, birds are fish with wings, cows are fish with udders. This tale illustrates both the creative opportunities and dangers inherent in the fact that people construct new knowledge based on their current knowledge. – pp. 10-11, How People Learn: Brain, Mind, Experience, and School, by John Bransford et al. This understanding is presented as a scientific advance over behaviorism, described as the “credo” that was dominant from the time of Thorndike to the late 1950s (pp. 6-8). This is not another ideology–a “postcognitiv-ism“–but a new synthesis being forged after the dominance of cognitivism. Some of the key principles contributing to this new synthesis were understood, to some extent, even before Thorndike–and well before the cognitive psychologists. These ideas themselves have not appeared just recently, after or “post” cognitivism. What is new, in the wake of cognitivism’s near monopoly in some fields of scholarship, is the new synthesis within which these ideas are becoming hybridized and all the more fertile. 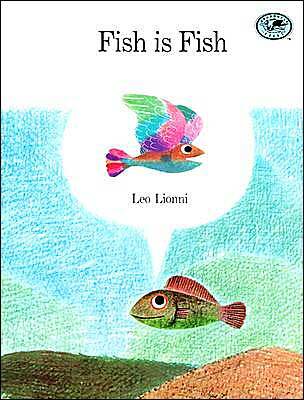 Interestingly, there’s another children’s book by Leo Lionni, the author and illustrator of Fish is Fish, that provides a perfect introduction to a different way of thinking about learning. This is another fish story, one that raises questions about both the learning process as portrayed in How People Learn [HPL], but also the ontological inevitability of development that we see represented in that use of Fish is Fish. Swimmy is the story of a small fish in a large sea full of wonders, who lives happily with his playmates until one day when all the others in his school are gobbled up by some large fish, and only Swimmy gets away. He is left roaming the big sea alone, still marvelling at all the wondrous things there are to see, but lonely without his friends to enjoy everything with. One day, Swimmy finds another school of fish just like the one that he belonged to before. But they’re all hiding behind rocks; and when he calls for them to come out and explore the sea with him, they say that they cannot, because they are afraid to risk getting eaten up by the larger fish. They come up with a solution, though, when they figure out how to swim together in formation, so it’s just like all together they are one big, even larger fish, that scares off the big fish that had frightened them before. Their lives are changed. A new life-world has taken form, in the formation of new practices in this school of fish, as a “community of practice”; and the lives of the participants in this community have been transformed, as well. As a community, and as individuals within the community, they have learned a lot, and they have learned practices for learning even more. There’s a whole lot of new cognition emerging here; but this cognition (and the advancing powers of cognition) are being formed in the formation of these fish’s socially situated practices. Communities of Practice” theory (sometimes CoP, partly developing out of work by Jean Lave and Étienne Wenger on “situated cognition”) is one of the theoretical traditions contributing to the “Post-(Cognitivist) synthesis.” In this approach (as in kindred traditions contributing to the new synthesis), there is no less recognition of the importance of “Pre-Existing Knowledge” than in the HPL approach; but the framework is not one in which the process of an individual learner re-constructing cognitive schemata can be analytically prised apart from the socially situated activity of humans coming to be, in their personal and social being, both as individual persons and as social groups. As in the tradition of curriculum theory, these approaches take social ontology as the fundamental matter, wherein coming-to-know can be understood only as it occurs in the course of coming-to-be. Before saying more about the theoretical approaches, I’d like to make some observations about Swimmy. First, it’s interesting to note that Swimmy is, by far, a more popular book than Fish is Fish–not only in the U.S., but in other countries, as well (see amazon rankings below). It would seem that one has to reach past Swimmy to find Fish is Fish as ones parable for learning. That is to be expected, however, without a perspective in which learning is understood as inextricably enmeshed in coming-to-be, for which Swimmy is a parable. It’s also interesting to notice how Swimmy is used around the world. 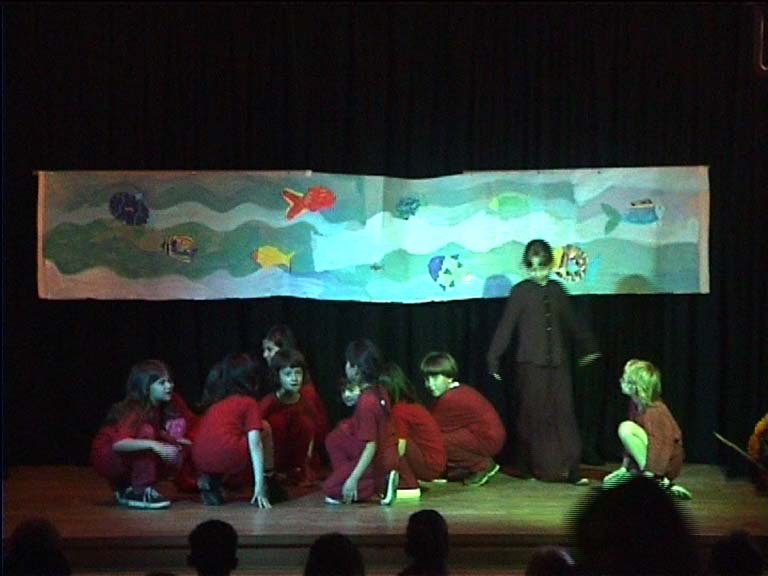 In Japan and Germany, primary school children can be seen staging performances of the Swimmy story (see photo at left); while in the U.S. it seems more common for children to produce large posters or murals. There’s also a delightful “紙作品” (”paper creation”) on the Web (which I can only link from here, and not reproduce, for copyright reasons), produced by Japanese students joining with children in Pakistan in connection with a Natural Disaster Youth Summit, a project of the International Education and Resource Network.
. . . what is that “what” that learners are learning? Facts? Knowledge? Skill? Yes, but perhaps that is not the most crucial way to characterize what is going on. We might not want to take the study of learning to be first and foremost the study of knowledge people are acquiring, though theories of learning have traditionally been based in epistemological analysis, in the philosophy of knowledge and knowing, hence on conceptions of the knowing, contemplating, (representing, problem solving…) person. In contrast, learning, viewed as socially situated activity, must be grounded in a social ontology that conceives of the person as an acting being, engaged in activity in the world. Learning is, in this purview, more basically a process of coming to be, of forging identities in activity in the world. Lave, Jean. “Learning as Participation in Communities of Practice.” Paper presented at the American Educational Research Association, San Francisco 1992. New experimental tools, methodologies, and ways of postulating theories made it possible for [cognitive] scientists to begin serious study of mental functioning … and, in recent years, to develop insights into the importance of the social and cultural contexts of learning (e.g., Cole, 1996; Lave, 1988; Lave and Wenger, 1991; Rogoff, 1990; Rogoff et al., 1993). – page 8, How People Learn: Brain, Mind, Experience, and School, by John Bransford et al. But for Lave, as for Curriculum Theory generally, it is a mistake to think of learning’s social situation merely as a “context” or “environment” for learning–as in what Lave once characterized as a “cognition-plus” approach for adding situational context to one’s picture of how cognition happens [Lave, Jean. “Situating Learning in Communities of Practice.” In Perspectives on Socially Shared Cognition, edited by Lauren B. Resnick, John M. Levine and Stephanie D. Teasley, 63-82. Washington, DC: American Psychological Association, 1991.]. Situational “contexts of learning” can be added to the picture as providing “important” environing conditions for cognition and learning, but without much affecting what “cognition” or “learning” are understood to be. For none of us was school ever an ‘educational environment’. It was our situation and our situation is never identical with our environment. Environment denotes a field before it is transfigured by human intention into a field for action. It is the field that is described by those, so-called, ‘detached observers’. Situation, on the other hand, places the human actor at its centre. Its horizon is lodged within his perception and its meaning spans the distance between his history and his imagination. – p. 31 of Pinar, William F., and Madeleine R. Grumet. “Theory and Practice and the Reconceptualisation of Curriculum Studies.” In Rethinking Curriculum Studies: A Radical Approach, edited by Martin Lawn and Len Barton, 20-42. London & New York: Croom Helm, 1981. These Curriculum Theorists’ reference to the horizon of the human actor’s situation invokes, of course, the whole horizonal phenomenology of human understanding, as elucidated by such philosophers as H-G Gadamer. 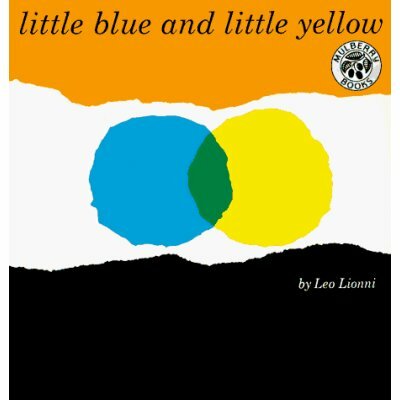 And, once again, the great children’s book author and illustrator Leo Lionni is here waiting for us, with his book little blue and little yellow. From Gadamer, we understand how learning happens in a “fusion of horizons” between, for example, a writer and a reader. Just as the very “selves” of little blue and little yellow become formed anew through a fusion of their formerly separate horizons, so too is learning, generally, a matter of social ontology, and not merely a matter of (fish or human) individuals (re-) constructing purely cognitive schemata. With this understanding of cognition and learning, as inextricably enmeshed in the lifeworld of human coming-to-be, Curriculum Theory has insisted on the need for understanding that is informed not only by the social sciences, but by ways of understanding cultivated within the humanities, as well. In the late 1950s, the complexity of understanding humans and their environments became increasingly apparent, and a new field emerged— cognitive science. From its inception, cognitive science approached learning from a multidisciplinary perspective that included anthropology, linguistics, philosophy, developmental psychology, computer science, neuroscience, and several branches of psychology [citations omitted]. page 8, How People Learn: Brain, Mind, Experience, and School, by John Bransford et al. We might expect Lave to be unsatisfied by an appropriation of anthropology into a “cognitive science” project that (as noted above) merely adds the socio-cultural situation as an environment that’s “important” in conditionally affecting the success of learning, but with learning understood as merely a conditionally environed, but still an essentially cognitive matter. Curriculum Theory embraces Lave’s more radical anthropology. From at least since Paul Klohr’s reading of Kafka, however, and Pinar’s reading of Sartre, and Grumet’s reading of Grotowski on “Poor Theater,” Curriculum Theory has recognized that curriculum, in its actuality, requires an even broader panoply of approaches for inquiry, including artistic modes of rendering experience as well as critical insight, along with approaches from the humanities as well as the social sciences. In the past three decades of curriculum inquiry, the varieties of such modes of inquiry have blossomed profusely in the work of thousands of curriculum researchers and scholars. The first chapter of HPL is quite ardently intent on establishing the credentials of “the science of learning” as a “science,” which is understandable during the regime of an administration in Washington that actively seeks the elimination of inquiry that does not fit it’s definition of “science based research.” Note how the “multidisciplinary perspective” touted by HPL (in the quote above) is comprised of psychology and neuroscience, other social sciences, and formal sciences such as computer science and certain types of philosophy. The HPL quote mentions “philosophy,” but the “learning science” that HPL refers to is not seen to be informed by any use of philosophers like Sartre. Sartre is, however, among the phenomenologists included in one of the “postcognitivist” MIT Press books that I am now reviewing: Where the Action Is: The Foundations of Embodied Interaction, by Paul Dourish (2004). Without enshrining Sartre, in particular, we recognize the importance for curriculum of recognizing how cognitive learning takes form within the existential / ontological activity in which human being(s) is(are) formed, as we’ve seen recognized by Maxine Greene in her writing on Curriculum and Consciousness. Sartre’s ontological investigations were, of course, articulated before cognitivism, not after or “post-.” What can be said to be a “post-(cognitivist)” development is the re-articulation of those principles and insights within a new “post-(cognitivist)” synthesis. Likewise for the principles and insights elaborated in John Dewey’s work, as, for example, in the points quoted on this blog concerning the curriculum as journey, in relation to the map and territory. The curriculum is not the map; nor is it the territory to be “covered” that is represented by the map: the curriculum is, rather, the journey. The cognition, and the powers of cognition, formed by each traveler will be as different from each other as their respective journeys through the territory, yet each traveler’s journey is informed by prior travelers, as their journeys have informed what is now seen onthe map. The map as a mediating sign or artifact, in this account, is involved in much the same way as the designed interfaces in the Human-Computer Interaction books that I’m reviewing. What is being mediated are the practices of communities, which (both the practices, and the communities) take form, as the individual participants take form, in the activity itself. This is the Swimmy story, and that of Little Blue and Little Yellow, not just that of Fish is Fish. To speak of mediative signs, or semiosis, is to invoke the work of C.S. Peirce, whose semiotic theory shows how an activity-oriented understanding of cognition and learning is rooted in the most basic principles of how meaning itself is potentiated in the activity of signs, for reasons that are profoundly semiological, and not merely psychological. (See, e.g., my soon-to-appear “Education à la Silhouette: The Need for Semiotically-Informed Curriculum Consciousness.” Semiotica 164, no. 1/4 (2007): pp. 235-329.). Again, Peirce wrote well before the ascendancy of cognitivism, but his ideas now inform the new post-(cognitivist) synthesis. But this new synthesis is not a fait accompli. To note how various ingredients were already extant before the rise of cognitivism is not to conclude that we can go back to what we were doing before, or what we have been doing all along. There is conceptual work to be done, but not only conceptual or theoretical work. An advantage of curriculum is that we are always pressed with opportunities to use and test our ideas in the reflective practice of curriculum. As we do this, we can be among the lead participants in the forging of a new post-(cognitivist) synthesis. Whitson, J. A. (2007). Curriculum & the post-(cognitivist) synthesis. Retrieved Month date, 20xx from https://curricublog.wordpress.com/2007/01/28/postcog-curriculum/. Whitson, James Anthony. “Curriculum & the Post-(Cognitivist) Synthesis.” (2007), https://curricublog.wordpress.com/2007/01/28/postcog-curriculum/ (accessed Month date, 20xx). This work is also licensed under a Creative Commons Attribution-Share Alike 3.0 Unported License. This entry was written by Tony Whitson and posted on January 28, 2007 at 10:39 pm and filed under blog, Curriculum Theory, educational psychology, James Anthony Whitson, lexicon, Psychology. Bookmark the permalink. Follow any comments here with the RSS feed for this post. Both comments and trackbacks are currently closed. Would it be unfair to make the observation that the HPL authors (to use their own Piagetian vocabulary) seem to have assimilated points from the social-ontological accounts of learning (in the works of Cole, Lave, Wenger, and Rogoff) into HPL’s “Pre-Existing” mental-constructivist schema, without the accommodation that would enable them to take notice of the different fundamental principles involved? How much would that (ironically) be like the cognitive scientists being in the pond with the little fish: Hearing tadpole tales about transformative situated participation (in which cognition is transformed inseparably from the transformation of identities of participants, practices in which they are participating, and the social groups in which those practices are conducted), the cognitive theorists picture Jean Lave and the other social-ontological researchers and theorists as cognitivists who have contributed “insights into the importance of the social and cultural contexts of learning” – i.e., their importance as contexts for “learning” that is still understood as something that’s essentially a cognitive, rather than a social-ontological, phenomenon. Are they depicting Lave et al. as fish walking upright, on tail fins?